SPECIAL DESIGN: Simbol of Eternal Love, Romance, Hope and Happiness. Special Design for Girls/ Lady/ Woman. Elegant CRYSTAL from SWAROVSKI & High Quality Rhodium Plated Alloy, the Crystal Shine Provide You a Peculiar Visual Feast by Refracting Sunshine. HIGH-QUALITY: 100% Genuine SWAROVSKI ELEMENTS Crystals & Rhodium Plated Alloy. 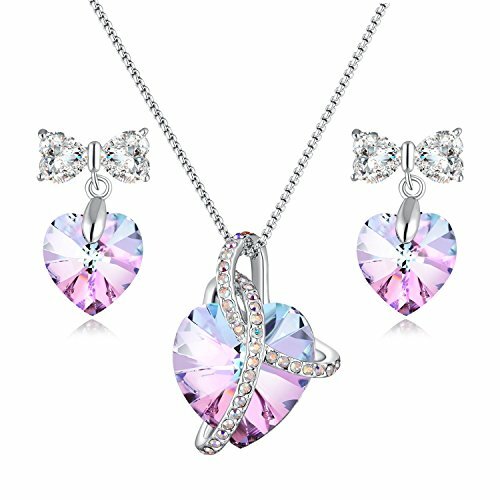 Made from Swarovski love heart shape crystals perfect match your style, makes you look super-hot. Best and unique design, elaborate inlay craftsmanship, more sophisticated technology and come with a upscale SEALED Gift Box. Nice GIFT for Your Mother, Lover, Wife, Fiancee, Girlfriend on Birthday, Wedding Anniversary, Valentine's Day, Christmas,and any other Big days. If you have any questions about this product by PLATO H, contact us by completing and submitting the form below. If you are looking for a specif part number, please include it with your message.